I have always wanted to do outfit posts but was a little apprehensive because I thought that it would make me appear self absorbed. My take on outfit posts has since changed since attending the Blog better Boston Style summit last weekend. I discovered that some of the most successful bloggers do outfit posts and they are far from self absorbed. I have come to realize that outfit posts are a great way to showcase one’s style and they are fun too! My first outfit post will showcase a black and white casual outfit that I wore to the mall this weekend. The ensemble included my go to black skinny jeans, a white blouse and black and gold flats. 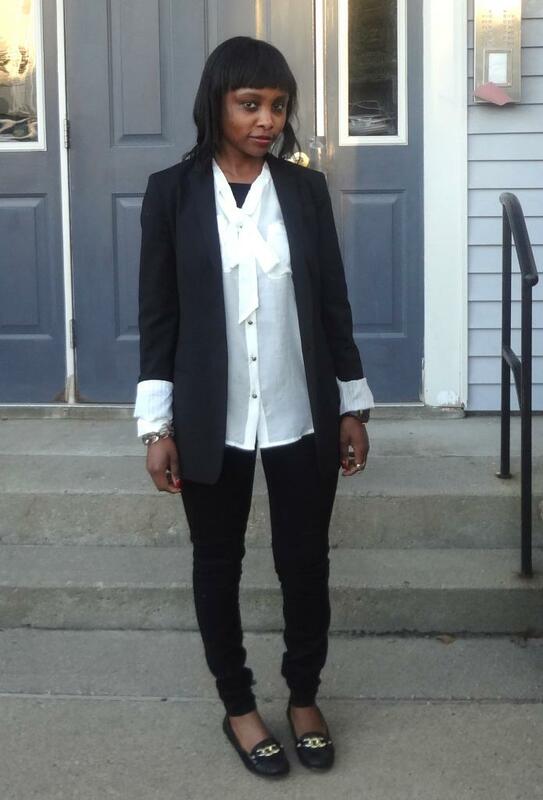 Since it was a little cold I layered the outfit with a black boyfriend blazer. White blouse : Loft originally $49 – got it on sale for $29! Boyfriend blazer : Club Monaco originally $249 – got it on sale for $100!